Best International Documentary at Wine Country Film Festival (California, USA). To be a harp player or a proffesional guard-for-hire? A young musician, at the very beginnig of his professional career. As many creative-minded young people in Latvia, he faces a dilemma: to devote his life to art or to change his profession and live a financially more guaranteed life. 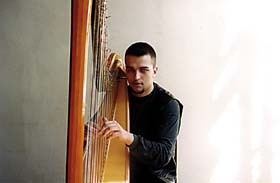 Young harp-players story and his creative road in the pragmatic world of today.